AFIadmin, Author at Advanced Facilities, Inc.
Now more than ever, IT-focused organizations need to modernize their outdated and inefficient data-centers. One of the best places to start is with a detail assessment of your data center. 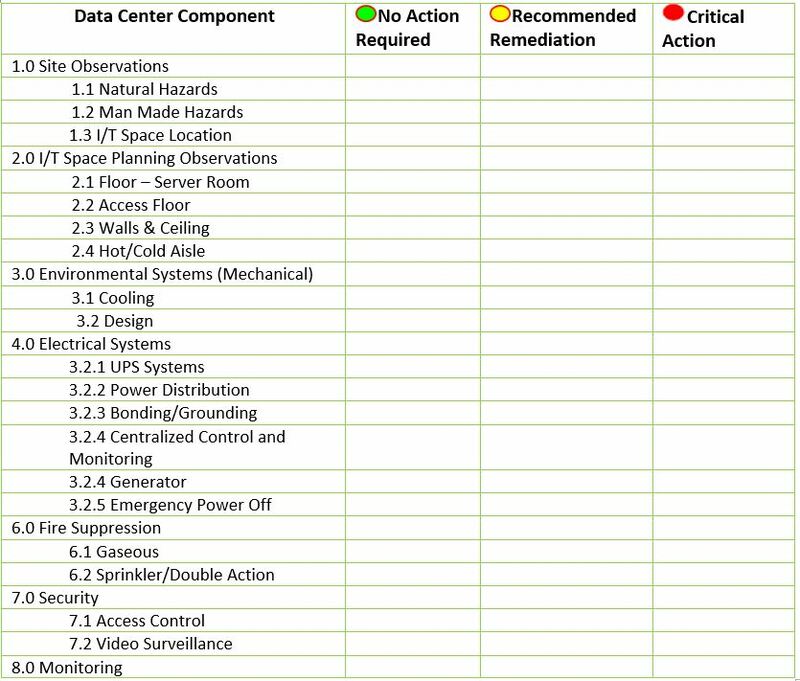 Advanced Facilities engineering team will provide thorough review of all your key components of your data center infrastructure.The chart below is an overview of items that will be reviewed, each will have recommended action for remediation if not given passing grade. At the conclusion of the assessment, a report will be presented and include findings during the site visit, recommendations for any actions determined, priorities identified and budgets listed. The intent of this assessment is to provide recommendations and an overall assessment of the data center infrastructure. Recommendations for repairs and/or improvements will based on our experience and industry “best practices”. Here’s an actual assessment we delivered to a client looking for help with their current data center that recently experience downtime, as well as a review of another site being considered for their primary data center. The content is real, but had to change the name to protect identity. If you have additional questions about this report or how we can help your organization determine the capabilities of your data center, please reach out to schedule some time with our team. 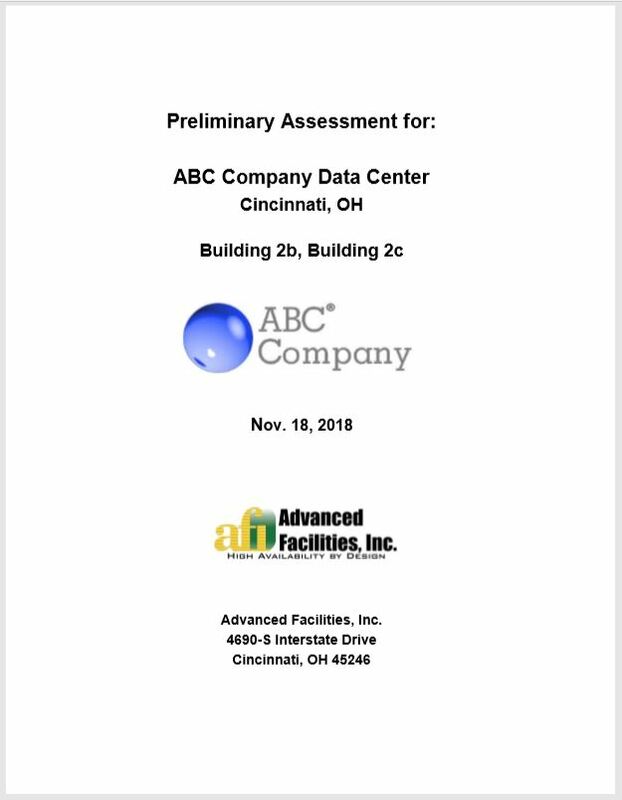 Filed Under: Data Center Build, Data Center Management Tagged With: Assessment report, Data Center Assessment, Data center assessment process, Do you have a modern data center? This article will help your organization in PDU Selection – During the build-out your company’s data center, you will eventually land on the question of which PDU (Power Distribution Unit) to run with. 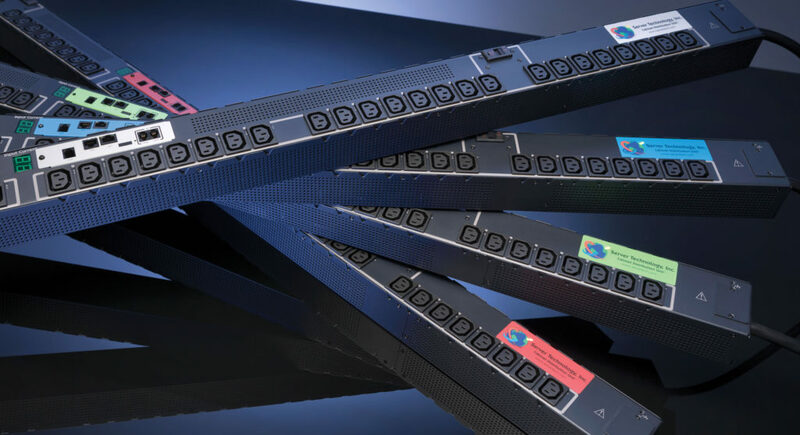 There are some very interesting and innovative PDU options on the market, but do they make sense for what you are trying to achieve? Before you decide whether to go with a “Smart” PDU or a basic solution, there are a few questions that need to be addressed. Choosing the right PDU will go a long way to influence how flexible, scalable, and ultimately reliable your data center will be over time. It’s important to know certain specs before getting started regarding your data center’s power-strip selection. Do you want a vertical or horizontal rack PDU? How about the approximate amperage and voltage requirements for your data center? Based on your region, what are the plug types and cord lengths required? Finally, how important is scalability and real-time transparency into your power utilization? Once you have a solid understanding of where your IT team stands concerning these questions, as well as where you are heading in terms of growth, then you can move on to selecting the right PDU for your data center. While the “Smart” PDU options may sound like the smartest way to go, sometimes a basic solution is a much better fit. If your organization is on the smaller side, a basic PDU may really be all you need, and in the long-run will save you money and potential confusion. The basic solution is exactly what you would expect, nothing too fancy, just a power strip with a pre-selected number of power outlets. A lot of manufacturers will offer options like surge protection, color-coded receptacles, and even “basic-upgradeable” power strips that are designed for growth. The cons of a basic solution are an absence of a graphical UI and internet connection, but for a smaller company with an IT team in close proximity to the data center, a basic solution is all you need. 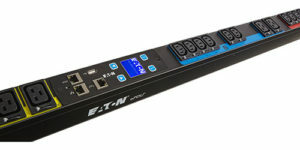 The first of our three smart PDU options is the “Metered PDU”. Unlike the basic solution, the metered PDU tracks your company’s power consumption through a local GUI that shows key metrics like current, amperage, power factor and more. Certain metered PDUs come equipped with a light communication-enabled GUI. This allows access to your authorized staff to scan non-readable code on a digital display using a mobile device camera. This light communication-enabled GUI transfers the power consumption metrics to the device where they can be exported and utilized for capacity analysis and electrical load balancing. Taking intelligent metrics a step further is the “Monitored PDU” option. 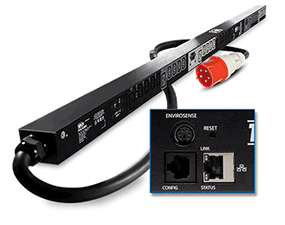 Here, you have a PDU wired directly into the data center or server room’s network, remotely transmitting real-time consumption metrics down to the outlet. These consumption metrics are transmitted to a secure web interface so your IT staff can monitor power utilization regardless of their location. There are several benefits with the monitored PDU option, including automatic alerts when the safe threshold is exceeded, increased precision in usage tracking, more precise load balancing, and additional ports for environmental monitoring. This option is definitely recommended for high-density data centers, large colocation facilities, and for cloud vendors who need to support fluctuating power loads. For large-scale or geographically data remote data centers, there’s no better option than a “Switched PDU”. By far the most innovative among the choices of smart PDUs out there, the switched PDU has everything that the monitored PDU has with one big difference: it can be controlled remotely. A switched PDU solution enables your data center personnel to shut down individual power outlets from a web interface. Using this functionality, they can power-cycle equipment for troubleshooting or to power down equipment during non-peak hours. 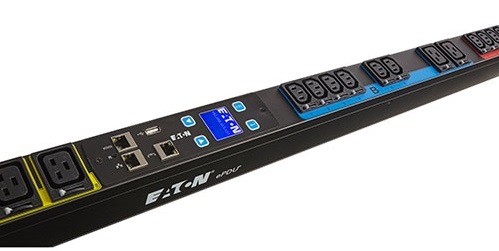 The switched PDU is especially useful for cloud providers that need to activate and deactivate equipment in a major facility or even an entire network of facilities. Visit or UPS and PDU page for more details of contact us if you have any questions! You’ve decided it’s time to make some changes with your data center, but you have some concerns. Perhaps you’re worried about security, growth, or you just want something more reliable when it comes to your data, but now you’re faced with multiple options and a major decision. In the planning phase for a project of this magnitude, there are many things to consider including concerns for capacity, reliability, control, privacy, and more. Is it better to build a data center for yourself, or share one and go down the colocation path? On top of these complex issues, the day-to-day demands of running an IT-focused business keep marching on. The more time you spend in the planning phase, looking at sites, comparing costs, and predicting how the business will scale for growth, is less time you are spending on addressing the needs of your actual customers. Although colocation (“colo”) may seem like an attractive option, you need to think about costs and control. A colocation strategy might be saving money in terms of energy and setup costs, but in the end you will be paying for it when it comes to provider service charges. In fact, you may be paying more in the way of service charges to the point that it would be more expensive than paying for your own data center. Control is another major factor to keep in mind. Going the colocation route will ultimately leave you with less control over your data. Since you are not the owner of the data center, you are subject to regulations that could restrict access during certain days and times, inevitably slowing down the speed at which you can make changes and business decisions with your data. Another option you may be considering is building your own data center. It’s a seemingly empowering and strategic move, but you will need to educate yourself in many different areas to pull this off. For instance, finding the right site location for the data center may seem easy enough, but unless you are well-versed in real estate and property purchasing, there will be many headaches in your future. Keeping costs down, capacity concerns, construction costs, taxes, and equipment are just a few buckets of importance in building your own data center that result in less time spent on your business and customer needs. 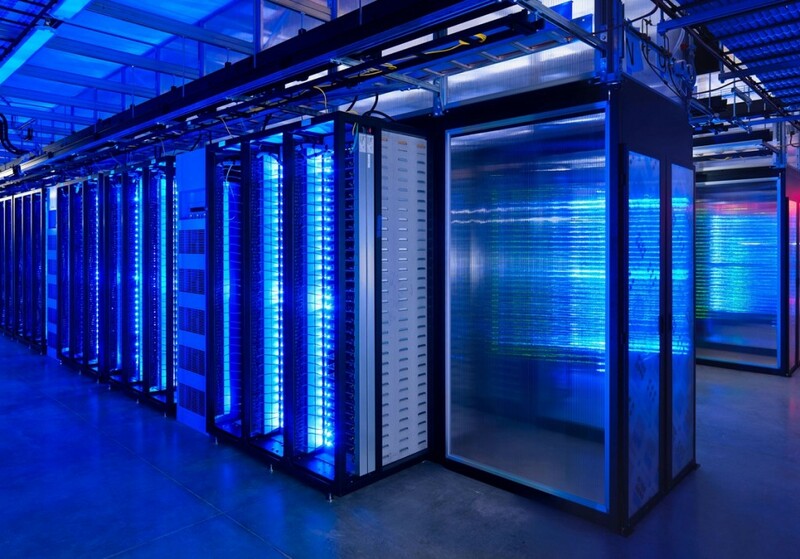 Custom-built data centers from a team of experts may be your best option for several reasons. By customizing your data center from the ground up, you have an investor-friendly option that allows you to choose the design, location, and size that meet your specific requirements. By leveraging a team who specializes in these types of builds, you’ll ultimately have more control and security over your data, save money where it counts, and have the flexibility and scalability for growth moving forward. Consider all options before diving into a new solution for your data center. What seems like the best or most attractive option for some organizations, may not always be the best fit for yours. Questions? or want to engage our data center designers? 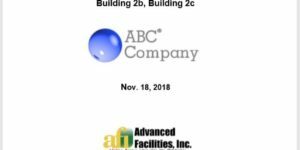 Filed Under: Data Center Build, Featured Tagged With: Build your own data center, Co-location, Custom-built data centers, What to Consider When Building a Data Center? Now more than ever, IT-focused organizations need to modernize their outdated and inefficient data-centers. Quite often there are small, and simple steps that can be taken to ensure that you are getting the most out of your data-center and that it’s as reliable as possible. Below are a few steps that you can take to modernize and improve the efficiency of your data-center. Learn from the power you are using. Quite often, old and outdated data centers do a terrible job at monitoring and reporting on power usage. Upgrade your reporting software and metering devices so that your data center managers can learn from the data. 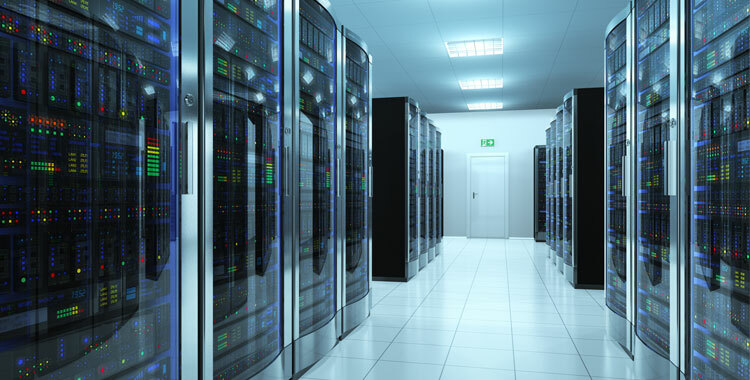 Collecting and archiving company-wide power-usage data allows the data center management team to perform analysis or failures, fine-tune energy management methods, and address potential maintenance issues. Give your secondary emergency power protection a promotion! Considering vast improvements in recent years in generator technology, data centers very frequently still rely on an effective secondary emergency power source. Quite often, your secondary emergency power source is an important last line of defense when problems arise. By enhancing this secondary power source, through implementing automatic transfer switches, versatile assemblies, and advanced controllers and meters, you can seamlessly transfer essential loads from one power source to another. Boost your power and energy. Modern electrical distribution strategies can increase not only your power density, but also energy efficiency and flexibility at the same time working to minimize overall maintenance. Stepping up your PDUs (power distribution units) can lead to a minor but significant (up to 3%) increase in efficiency in the majority of data centers. Using this strategy will also reduce your needs for cabling, while enabling you to effectively manage power usage all the way down to the outlet. Step up your switching equipment maintenance. Many classic data centers have their switching equipment designed to provide 20 years of service, assuming there are properly maintained. You can improve the overall safety and performance by servicing the switches on a regular basis, updating relay schemes and circuit breakers every 10 to 12 years. Watch out for higher-than-normal temperatures. Be sure to take advantage of automated controls and sensors when it comes to catching above average temperatures in your data center. These automated controls and sensors will enable economizer cooling and airflow management solutions to get to work, ensuring improved comfort and performance levels. Upgrade UPS Productivity. A relatively low-risk and low-cost way to improve your data center is to upgrade your UPS with a newer model. Advanced UPS systems running in high-efficiency mode can deliver an efficiency of 99%! This is a great method for boosting reliability, overall annual savings, and cutting energy waste for your organization. Consider new cooling techniques. Your IT equipment footprint maybe decreasing but its power requirements are most likely increasing. Review your current equipment rack capabilities and consider upgrading to take advantage improved cooling, cable management and modular design. Effective cooling techniques use the best rack containment schemes for active cooling instead of controlled ventilation. LEDs…. For long term savings. Although it is a smaller chunk of your overall data center power usage, when you invest in LEDs for lighting, you can expect some major cost and energy savings over the long term. Look for an integrated, multi-sensor technology approach for your lighting solution to help automate gains using daylight and occupancy sensors. Questions for our team? Contact Us Today! 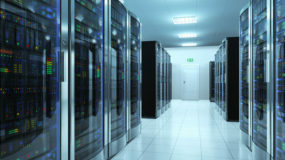 DATA CENTER COOLING: ARE YOU UP TO CODE? We have seen horror stories of companies hemorrhaging thousands of dollars per month on computer room air conditioners that are not efficient. This is a short article that is just meant to make people think. It is always good to have an organization come in and evaluate your CRAC units to make sure they are sized accordingly. Too much and too little air conditioning can greatly affect your bottom line. It is also a great idea to make sure you are meeting LEED requirements and state codes. All of these points ensure that you operate at the best efficiency.